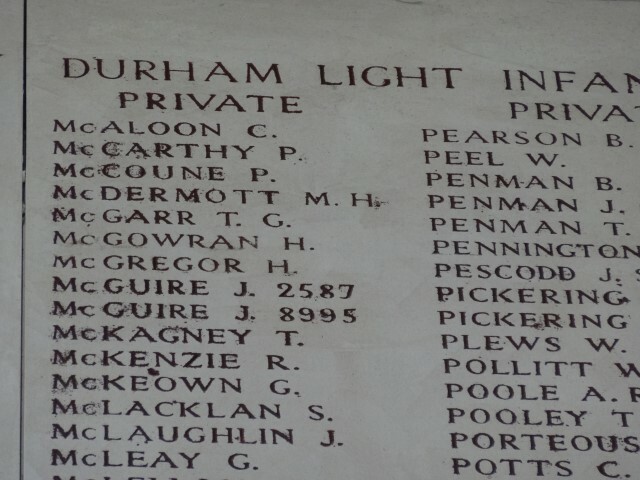 2587 Private Joseph McGuire 1/9th Battalion, Durham Light Infantry was killed in action 14 July 1915 and is commemorated on the Ypres (Menin Gate) Memorial, Belgium. He was 28 years old, the son of James and Bridget McGuire of Witton Park and husband of Jane McGuire of West Stanley. He is possibly the J. McQuire commemorated on the St. Helen’s Colliery Memorial Cottages but no direct connection with St. Helen’s Auckland and St. Helen’s Colliery has been identified. No other family named McGuire or McQuire has been traced living in the Bishop Auckland area. It may seem unlikely that a family would move from Tyneside to rural County Durham where there would be fewer employment opportunities but that may have been the case. In the absence of any other information an assumption has been made that 2587 Private Joseph McGuire is the soldier commemorated on the St. Helen’s Colliery Memorial Cottages albeit the link is somewhat tenuous. John Henry (born c.1889) and James (born c.1891) are not recorded. Catherine (aged 17) was married to 20 year old Patrick Taggart (from Ireland) and they had a 3 month old son, James born at Stanley, Co. Durham. In 1901, Joseph’s grandmother Catherine Docherty, a widow aged 66, is recorded as an inmate of the Union Workhouse, Bishop Auckland. She died aged 73 in 1908 at Auckland. In 1909, Joseph McGuire married Jane Coggon at Lanchester, County Durham. By 1911, Joseph and Jane lived at Swalwell, Gateshead where he worked as a coal miner. They had a 1 year old daughter Florence Theresa who was born at West Stanley. Their niece, 4 year old Catherine Taggart was with them at the time of the census. Patrick and Catherine Taggart still lived at West Stanley and by 1911 had 7 children. After Joseph’s death, Jane returned to West Stanley and lived in Theresa Street close to her sister-in-law, Catherine Taggart. 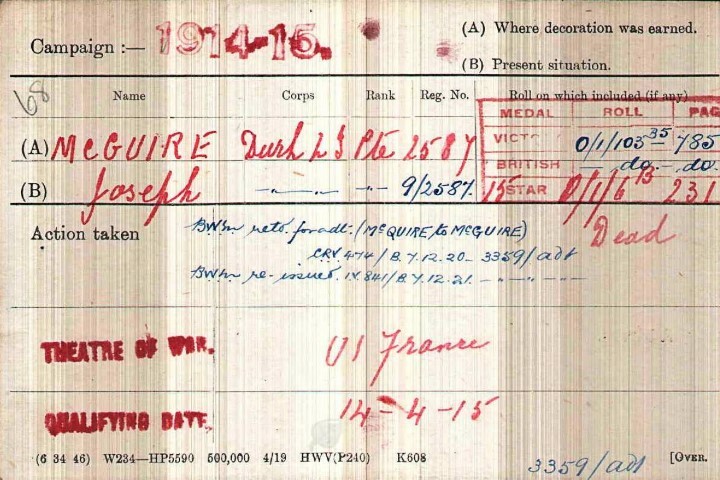 Private J. McGuire was awarded the 1914-15 Star, the British War and Victory medals.